Our weekly Book Club at Fries Moravian is just about finished with our current book. 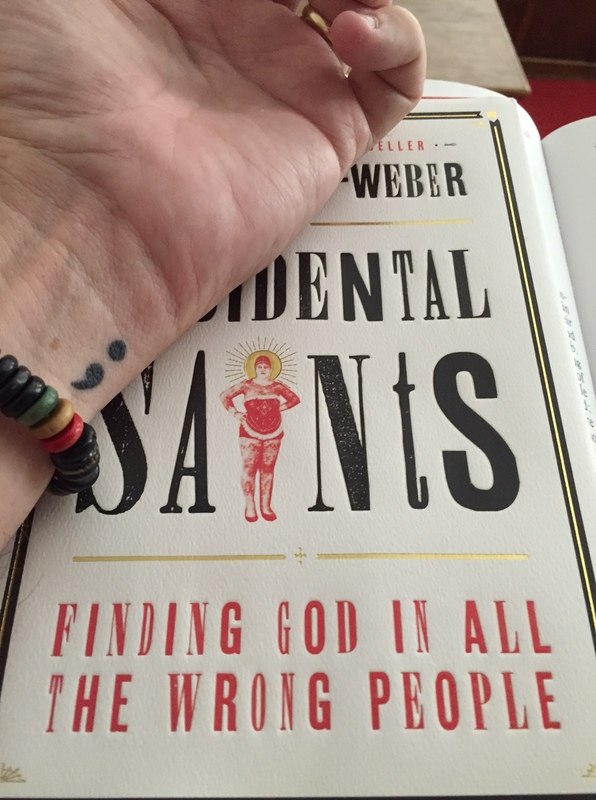 For most of the summer, we have been reading Accidental Saints: Finding God in All the Wrong People, written by Nadia Bolz-Weber. Even though she is an ordained Lutheran pastor, a lot of people would say that she is one of the “wrong people.” At least she would seem that way when judged solely by her appearance. Nadia definitely doesn’t look like a pastor. Even when she is wearing her clergy collar, she wears it with sleeveless shirts so everyone can see her muscular arms, which are covered with tattoos. Despite her appearance and her rough language (she definitely uses language that I wouldn’t use in church), despite her not looking like we expect a pastor to look or writing like we would expect a pastor write, we have all really enjoyed the book. It has inspired some very good discussion and offered some wonderful insights into our lives as Christians. Even though sometimes we still find ourselves talking about how she looks. A few weeks ago, as we were talking about all of the tattoos that she has, one of the members of the group said something along the lines of never being able to imagine a pastor with tattoos. It was not at all judgmental, it was more of a statement about how much things have changed over the years in the world and in the church. Hearing it, though, I couldn’t resist pointing out that I have a tattoo myself. I was honestly surprised that it hadn’t been noticed before. It is pretty visible, if not obvious. My tattoo is right on the side of my left wrist and I got it on July 22, 2015; Kelly’s birthday. And she has one too, on the side of her foot. We went together to get them to celebrate her birthday last year. I never EVER thought I would get a tattoo. And there was even less chance that Kelly would get one. But it just seemed like the right thing for us to do. Our tattoos are both semi-colons and they represent the importance of not putting a period where God puts a semi-colon. A period signals an ending while a semi-colon is just a pause. Whenever a writer uses a semi-colon, it is a reminder to stop and pause, to take in and reflect upon everything that is going on. As God is writing the story of our lives, he only uses a period once, on the day our life is meant to come to an end. But God uses semi-colons a lot. Because as God’s children, our lives are a continuing story. A story that requires us to pause every once in awhile; to reflect on where we are and where we have been and where we want to go; to reflect on who we are, who we have been and who we want to be. A semi-colon is a reminder to take time for that pause and that reflection. As many of you know, Kelly struggles with depression and we have both had family members who have suffered from addictions. So I decided (and amazingly Kelly agreed) that we should get semi-colon tattoos to remind each other, and everyone who sees them, of the importance of not putting a period where God puts a semi-colon; as a reminder of the importance of maintaining faith and hope; as a reminder of the importance of choosing life. It is a choice that we all face; to choose life over death. As we read in Deuteronomy, “I have set before you life and death, blessings and curses. Choose life…” So there it is. Life and death, blessings and curses are set before us. And the choice is ours. Certainly, for many people, it is very much a literal choice between life and death. Mental illness, depression, addictions, often lead the sufferer to consider taking their own life. They are unable to see life and blessings as belonging together. They see life as a curse, for them and for those that love them. They feel that the best way, the only way, to end that curse is to end their life. In 2014, more than 41,000 Americans chose to end their life. They chose death over life. That means, on average, 112 people each day make this choice for death over life. Some people believe it to be the “unforgivable sin.” I don’t believe that it is up to us to decide or determine what sins are forgivable and which are not. But it is up to us to help bring those numbers down. It is up to us to help EVERYONE choose life. It is up to the church to be the place where those who are struggling with this choice, who are suffering so greatly from illness of body, mind and spirit that they are contemplating choosing death over life; it is up to the church to help them find ways to choose life. It takes more than simply telling them to pray more or read the Bible more. The church needs to be a place where these struggles can be talked about; safely, openly, freely. The church needs to be a place where these struggles can be addressed. Not with judgement or condemnation or exclusion; but with love and compassion and inclusion. The church needs to be a place of the “Semi-Colon.” The place where people can come to pause; and reflect on where they are and where they have been and where they want to go; and reflect on who they are, who they have been and who they want to be. The church needs to be the place where people can not only come to pause and reflect, but also the place where they can come to be reminded. Reminded that they are they beloved children of God; reminded that they are created in God’s image; reminded that they are loved unconditionally. The church needs to be a place where the choice that is set before, the choice between life and death and blessings and curses, becomes much easier to make. This is a place that we all need. Whether we suffer from a mental illness or not, whether or not we struggle to choose physical life over death, we are all still faced with that choice. Each and every day we are faced with the choice between life or death, blessings or curses. Even when we are not faced with the choice of whether physically live or die, we are faced with the choice of what kind of life we will live. Will we choose a life of blessings or a life of curses? This may seem like a ridiculous question. Of course we would all choose a life of blessings. But while we may think that we (and everyone else) would choose a life of blessings over curses; our actual lives, our true choices, tell a different story. We far too often choose curses over blessings, or we just choose to focus on our curses and not our blessings. Whenever we complain about what we don’t have rather than rejoice in what we do have, we are not choosing the life God has created us to live. Whenever we allow our fear and anxiety rather than our hope and faith to guide us, we are not choosing the life God wants us to have. Whenever we judge and exclude others rather than love and welcome them, we are not choosing the life that God calls us to live. The church does indeed need to be a “semi-colon place.” It needs to be a place where we pause and consider our choices, and resolve to choose blessings over curses. The church needs to be the place where we choose the life that God has created for us rather than the lives we create for ourselves. The church needs to be the place where we choose hope and faith, where we choose to be loving and welcoming. The church needs to be a place where we can all pause; and reflect on where we are, where we have been, and where we want to go; reflect on who we are, who we have been, and who we want to be. The church needs to be THE place where we can choose life; where we can choose to live a blessed and abundant life; where we can choose to share our blessings and our abundance with those in need. The church, the Moravian Church, THIS church, needs to be this place. And, sadly, right now, it’s not that place. We are not choosing life, we are not choosing blessing. We are complaining about all that we don’t have, rather than rejoicing in all that we do have. We are being guided by our fear and anxiety, rather than our hope and faith. We are judging and excluding, rather than loving and welcoming. As long as this continues, we are choosing curses over blessings, we are choosing death over life. Brothers and Sisters, it is time to choose life. It is time to choose blessing. It is time to choose hope and faith. It is time to choose love. God has set the choice before us. It is up to us to make it. So let us choose life and let us choose to be the people that God has created us to be; people of faith and love and hope. So let us choose blessings and let us choose to be the people that the world needs us to be. Let us make our church the place that God created it to be and that the world needs it to be; a place of life and a place of love.